What if there was a huge selection of travel publications screaming out for good informative copy? You’d want to learn where to find them, right? That’s where travel trade journals enter the picture. Most travel writers believe their primary targets are the glossy consumer travel magazines you see on bookstore magazine racks. Because these are the most obvious choices, travel magazine editors are inundated with queries from travel writers. Editors at the most prestigious and highest paying magazines receive several dozen pitches each day! These editors are highly selective about the writers they work with and the stories they publish. Beginners aren’t likely to get their stories published in these top shelf glossies. You’ll jostle around in the travel writing wilderness for quite some time before you score a lucky breakthrough into these elite travel publications. And this could take years! But writing for travel trade magazines can be a way to break into travel publications and get paid – without waiting years to do it. What’s special about travel trade journals? Getting published in travel trades is less competitive than for consumer magazines. That’s because most travel writers don’t know about these publications and so they don’t pitch them. And travel trade journals usually pay well. Let’s look at why these publications can be a good place to get published. So what’s a trade journal? These publications are targeted at people in a very specific industry or business. They’re also known as trade magazines, trade papers, professional magazines, custom publications, or simply “trades”. They can be print magazines or online websites. Trades focus on specific industries such as: agriculture, automotive, construction, engineering, food & beverage, forestry, manufacturing, landscaping, mining, travel, and tourism. Most industries have trade magazines. You just have the think of an industry and then find the publications targeted for that industry. What are Travel Trade Journals? 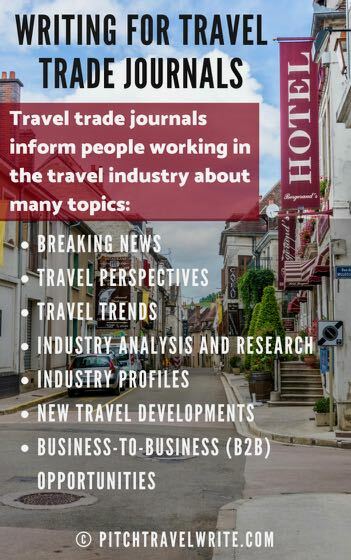 Travel trades inform people working in the travel industry about breaking news, perspectives, trends, industry analysis and research, industry profiles, new travel developments and Business-to-Business (B2B) opportunities. Travel trade publications and websites cover a wide range of related fields. For example, hotel operations and hospitality have travel trade journals targeted for their industry. So do the culinary industry, travel agents, luxury travel, cruise travel, and adventure travel. Just about every segment of the travel and tourism industry has trade journals. A significant number of travel trades help event planners – the people who organize corporate and business meetings, conferences and conventions. Meetings and conferences are big business because they bring large groups of people into a destination for a short period of time. Specific examples of the topics you’ll find in travel trade magazines include new hotels opening, new cruises being offered, or new airline routes and destinations that are opening. Some travel trades feature travel destination articles, just as you would find in any standard travel glossy. “Hard” information is important to editors of trade publications. Quoting statistics, highlighting new trends, and providing examples are well received by the “trades”. If you are able to supply a case study or quote an expert, your idea might be well received by the travel trades. Travel trades are a stealth publishing niche and remain very much under the average freelance writer’s radar. They’re an undiscovered market. And the trades generally pay well because of the higher level of expertise and research necessary to write for them. In many cases, the “trades” pay better than travel magazines! Solid pay rates are the reason writers like regular assignments with the trades – and don’t shout it from the rooftops. Writers who have discovered the “trades” are on a good thing. They don’t want to encourage more competition. The good news is there are plenty of travel trades out there. I have a list of more than 60 travel trades, and there are many more beyond my list. Writers with an interest in specialty travel areas should pitch their story ideas to the travel trades. If you’re plugged into a specific area of the travel business such as hotels, luxury travel or tours, you already have some resource material. Just refine your ideas and pitch to the editors of travel trades. A background in any specific area of travel is helpful but not always required. Above all, you’ll need good writing skills, a system for tracking down hot travel topics and trends, and a willingness to research your topics in depth. Trade magazine writers obviously need to build their industry contact lists. You’ll need to befriend destinations public relations and media reps, and in-house PR people as a start. I’ve written for seven trade journals in my freelance writing career, two of which have been travel trade magazines. A 700-word piece about the Mystery Weekend in Langley, Washington. Published in Northwest Meetings & Events magazine, it paid $350. A 1500-word article about how to behave on FAM Tours, published in the same magazine, and paid $600. The same editor commissioned a short article about sports venues in the Pacific Northwest, paying $250. A great travel piece in a trade called Off Road Adventures. This custom publication is for businesses associated with four-wheel-drive vehicles, such as repair shops and customizing and detailing shops. Here’s how I got a travel piece published in Off Road Adventures. A few years ago, I was planning a trip to England and lining up a string of U.K. travel assignments. One of the events on my list was the world’s largest military vehicle show in Kent. I wondered, “Would Off Road Adventures Magazine be interested in a story about this military vehicle show?” I pitched the story idea and the editor jumped on it. I was paid $1002 for a 6-page feature about this exciting event. The standard query letter is the best way to approach trade magazine editors. Pitch them a story aimed at their aspect of the travel industry. You can also introduce yourself to editors through the “back door”. To do this, you simply send a well-written letter of introduction to the editor explaining your writing and researching background, why you’re interested in their aspect of the travel business, and your background. If they’re looking for a writer, you might be able to get in this way. When you’re traveling independently, or on press trips of Fam Tours, you should always have your story antennae up for potential “trade” stories. For example, while you’re on a press trip touring wineries, breweries, distilleries, or restaurants pay attention to what they offer. Are any of them using new and innovative techniques or recipes? This has potential with a trade journal. If you discover something newsworthy, you simply need to track down appropriate travel trade journals that match your topic. Although the travel “trades” may not offer the glamorous patina of top shelf travel glossies, your chances of breaking into them are far better even if you’re a beginner. Your chances of getting repeat assignments with travel trade journals are much higher. I know several travel writers that glean significant incomes almost entirely from working the “trades”. But you’ll never know who they are because they’re keeping quiet about this undiscovered market! You can also do a search for “travel and tourism trade journals” or for a more specific travel topic to find more information.